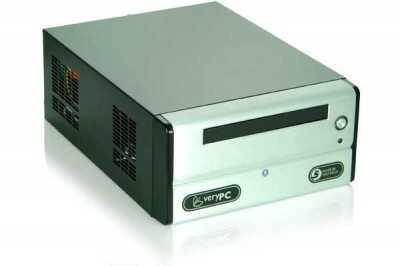 The GreenPC AT10 by VeryPC is an ultra small desktop featuring the Intel dual core Atom 330 CPU (operating at 1.6 GHz), 1GB memory (DDR2 800; expandable to 2GB), and 120GB Green Power SATA hard drive (expandable to 500GB). Power consumption of the GreenPC AT10 is less than 28 watts average use. The VeryPC GreenPC AT10 also features Intel’s GMA950 graphics chipset with 1X VGA and includes an S-Video port. 5.1 audio is included as well as 10/100 Lan, 1 parallel and 1 serial (RS232) port, and 2 front and 4 rear USB ports. The front Firewire port requires a Firewire adaptor for operation. A DVD-RW or Blu Ray/DVD-RW tray or slot loaded drive is optional as is an 802.11n wireless card. The computer ships without operating system, but Windows XP Home, Vista Home, 7 Premium (32 or 64 bit), or 7 Professional (downgraded to XP Professional) are available options. The computer has been successfully tested with Ubuntu Linux. Measurements of the GreenPC AT10 are 97 (h) X 202 (w) X 273 (d) mm. Warranty on the computer is 3 years, and the cost of the AT10 is £258.75 including VAT (£220.21 excluding VAT) without options. The computer is built to order with expected delivery time from 4 to 7 days.